This is a collection of reviews of great books for kids, ideas of ways to use them in the classroom and collections of books and activities about particular subjects, curriculum areas, themes and professional topics. The Current Issue of the Newsletter is out!! This issue features an Annotated List of Books Featuring Friendship for Grades Preschool through Ninth. Great books for kids with reviews, activities, links to related books and subjects on this site and links to other online resources. This section has all the featured books above plus many more recommended books. We have reviewed each of them and linked them to related areas of this site. This list is arranged by title, author, and grade level. Ideas for themes, topics and other subjects around which to focus class work, research projects, and discussion groups. Naturally, these subjects overlap with the above curriculum areas. Each subject, such as Trains or Colonial America, contains children's book titles, activities, and links to related areas of this site. Free Welcome To Homeschool Guide: Download Here! Time4Learning is a PreK-12th grade online homeschool curriculum. We handle all the lesson planning and grading. Our certified teachers provide encouraging feedback. Courses for all aspects of writing in grades 2‑12. Language arts topics such as Children's Literature, Reading and Writing, with articles, classroom activities, professional book excerpts and links to related Internet resources. A children's literature electronic newsletter available by e-mail or on this web site. The newsletters contain new book reviews, author studies, featured books in depth, classroom themes, and the latest news about the web site. Sign Up or Read Back Issues. Professional books on using children's literature in the classroom, historical fiction picture books and novels. If you've always wondered how to keep up with our latest professional and children's fiction book releases and where to obtain books and other products; here's the place. Here is a complete hierarchical Table of Contents of this site. So you don't miss a thing! Use this search form to look for specific authors, titles, and other subjects. Carol Hurst's Children's Literature Site does not collect and store information about individual web site visitors. If you sign-up for our email newsletter we need your email address and you may also give us your name but will not share that email address or name with any other company nor use it ourselves for anything other than newsletter mailings, ever. In addition, Google's Double Click may serve ads on this website. In doing so, one of their ad servers will place or read a unique ad-serving cookie on your computer and will use non-personal information about your browser and your activity at this site to serve ads on this and other sites. The ad-serving cookie is a persistent cookie. Please click here for more information or to opt-out of the Double Click ad-serving cookie. Don't miss a thing! Sign up for our Free Newsletter. Free Teacher's Guides for Novels, Picture Books and Nonfiction. For Preschool through Ninth Grade. 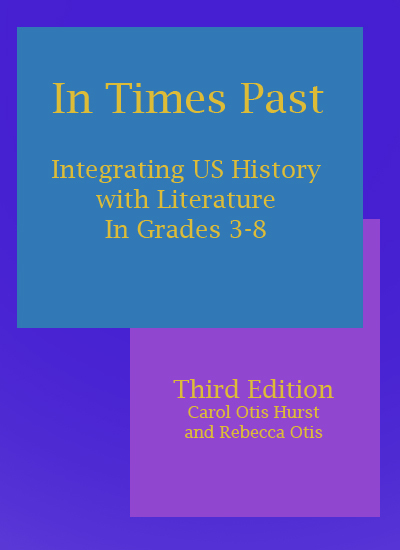 Integrating US History with Literature in Grades 3-8. Enliven your US History curriculum! Teach US History using great kids books. ws-na.amazon-adsystem.com Rocks in His Head. Pick up your copy of Carol's Award Winning Picture Book! You can help fund this site at no cost to you! If you shop at Amazon.com bookstore use This Page each time you enter Amazon.com. More information. Copyright 1996-2016, Rebecca Otis. This document is from Carol Hurst's Children's Literature Site at http://www.carolhurst.com.